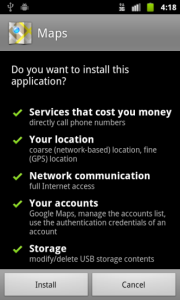 There are risks in installing apps on your phones and tablets, and the danger is real. It’s no secret that mobile devices have been all the rage for the past few years. In fact, at the end of 2011, approximately 34 percent of all households had only a cell phone, no landline whatsoever! That’s an amazing change for a device that, for all intents and purposes, has used the same technology for the better part of a century. More and more cell phones are turning into “smartphones,” though, or phones that can be used for much more than just making a phone call or sending a text. And although these smartphones can be a great business tool for advisors—allowing them to do things like review client portfolios, schedule appointments, tweet their views on the latest news, and get driving directions to a client’s office via GPS—they have a dark side. Smartphone applications (apps, for short) are increasingly popular. They are installed similarly to how software is installed on a Mac or PC. But there’s a catch—a few, actually. First off, the vast majority of computers run antivirus software, but a recent study indicates that only 11 percent of phones run this software. Even more disturbing is what I refer to as the “voluntary virus” that most users install on their phones each and every day; this risk is higher on Android devices than it is on an iPhones, as noted here and here and here. Indeed, nearly everyone accepts these types of warnings and proceeds with the installation. Which brings me to the essence of my point . . . When installing an app on your phone, be sure to read and understand what you are allowing that app to do. For a good sniff test, check how often the app has been downloaded and how other users have rated it. Applications with 50,000+ downloads and hundreds of positive ratings are usually going to be safe (e.g., Angry Birds). Fortunately for Commonwealth advisors, if you are ever unsure, you can contact our Technology HelpDesk for help. You can also contact your local tech specialist or even Verizon or AT&T. Of course, if you are unsure about an app, you should err on the side of caution. Your personal finances, business reputation, and client data are just too important to take for granted.